Due to the popularity of Coronado we respectfully request that should you need to cancel that you do so seven (7) days prior to arrival date with no penalty. Should cancellation occur within seven (7) days prior to arrival the first nights room and tax deposit will be retained. 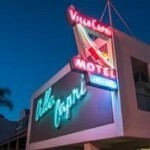 Welcoming its first guests in 1956, Villa Capri by the Sea has been a beloved fixture on Coronado Island for over 60 years and retains the remarkably warm, personal service that has always been its hallmark. 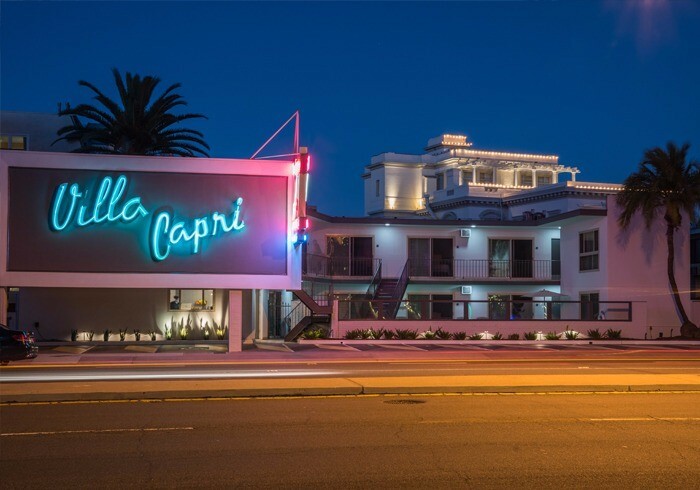 Originally constructed in the garden of a grand estate, the charming and well-maintained structure sits under the glow of its now-famous neon sign of a diving beauty. The Villa’s mid-century nuances delight travelers from all over the world who appreciate these vintage details. Villa Capri by the Sea offers guests an abundance of shopping, dining, and leisure activities such as golf and tennis -- all in close proximity. Just across the street stands the historic Hotel del Coronado in all its splendor. Want to relax by the ocean? Miles of white-sand beaches stretch out before you. Prefer to take in the marina? Complimentary beach cruiser bikes available for you to ride around the bay that’s just outside your door. Ready to explore off the island? A short cruise on the local ferry will deliver you to Embarcadero Park adjacent to downtown where you’ll find San Diego’s famous Gaslamp District, Petco Park, and just beyond that a world-class zoo, Sea World, Old Town, and all the thrills of a beautiful metropolitan city. Quite simply, everything is here for you. At 800-square feet plus, the rooms at Villa Capri by the Sea are spacious and comfortable. Many offer expansive layouts with multiple bedrooms and stocked kitchens -- ideal for families, extended stays, girls weekends and romantic escapes. All rooms boast beautifully maintained original 1950s tile in the kitchens and bathrooms, plus new Serta mattresses, heating and air conditioning, cable television, high-speed internet, ironing boards and hair dryers. Our staff is eager to make your stay a pleasure with friendly, personal hospitality you will remember long after you move on to your next adventure. The Wheelhouse (lobby) hours 07:00 - 11:00 and 16:00 - 21:00 daily, should you arrive outside of these hours please call (619) 435 - 4137 and we will make sure we are available for you and all your needs.